Man’s earliest ancestors might have originated as long as five million years ago in what is now the north of Kenya. You could say that the country’s indigenous population easily represents more diversity than any other African country; approximately 30 languages are spoken in Kenya. 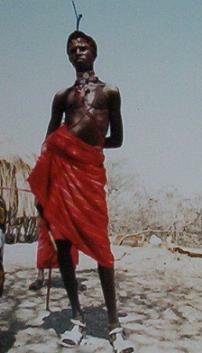 One of the biggest ethnic group is the Kikuyu; the smallest group is the El Molo, living on the shores of Lake Turkana. There are roughly seventy tribes dispersed around Kenya. They are made up of three primary grouping. The BANTU, who since 500 BC have been drifting to Kenya from West Africa; the NILOTIC tribes who arrived from Sudan and Egypt around 1000 BC; and the CUSHITES who made an entrance about 2000 BC from Somalia and Ethiopia. These groups make up approximately 98% of Kenya’s population. There are many sub-tribes too numerous to mention. The population growth in Kenya is one of the highest in the world. The economy is stretched to the limit as it tries to provide educational facilities and other services to the expanding populace. Many inhabitants are giving up life in the bush for an easier existence and more job opportunities in the cities and towns. We adding Prof. Wangari Maathai to the list of ‘Famous People from Kenya‘ as she simply can not be missed on it!!. Among the Bantu, the largest tribal group are the Kikuyu, Meru, Gusii, Embu, Akamba, Luyha (or Luyia) and Mijikenda. The Bantu are industrious farmers who have become the most prolific and wealthiest of the three tribal groups. The largest tribal population is made up of the Kikuyu, with the heart of this civilization mostly lying at a complex system of land ownership organized around the family. Perhaps better than any other tribe, the Kikuyu adapted to the challenges of the Western culture and their farmlands provide the bulk of the fresh produce sustaining Nairobi. Coffee, tea and other crops grown by the Kikuyu largely feed the rest of Kenya and are exported throughout the world. The Meru people live primarily on and adjoining the northeastern slope of Mount Kenya. The name "Meru" refers to both the people and the location. The Meru are primarily agrarian, with some animals. Their home life and culture is similar to other Highland Bantus. The Meru speak at least seven different dialects and as a whole exhibits much older Bantu characteristics in grammar and phonetic forms than the neighboring languages. Akamba people are best known for their beautiful wildlife wood carvings and high business skills; they started and still dominate the trade. Tsavo is the traditional home of the Bantu-speaking Akamba people, who are numerically Kenya's fourth-largest group. The Akamba are great traders in ivory, beer, honey, ornaments and iron weapons and, thanks to their knowledge of the interior of the continent, were able to cover a vast region that stretched from the coast to Lake Victoria. The Nilotic tribal groups consist of the Maasai, Luo, Turkana, Samburu and Kalenji. The most famous of these Kenya people are of course the Maasai, who live in the south of the country; the Samburu in the center of the country and the Turkana in the northwest. The Maasai are herders of cattle and goats. A very proud and beautiful kenya people, the Maasai enjoy adorning themselves with loads of beads and dressing in red colorful cloth. The women do all the day to day work, including building houses, while the men tend the cattle and make tribal decisions. The man are also known for their dancing; they jump straight up into the air and impress with the incredible heights they achieve. Despite government driving the Maasai to join the modern world, they have managed to hang on to their nomadic traditions. The Samburu live in mostly arid and often mountainous parts of the country, where survival is definitely only for the fittest. The Samburu dwell in small settlements called manyatta. If water and pasture for the livestock are depleted, they pack up and move on. Their diet contains mainly of milk, blood and meat. Samburu tribes-people take great pride in their appearances and adorn themselves lavishly and in great detail with beads, feathers and copper. The Luo people live mostly along the shores of Lake Victoria and have the second largest tribal population in Kenya. Their territory ranges from the Central Highlands to the coastal wilderness and the Tana River area. They are mostly known for their traditional ways of fishing for tilapia and other fish. Turkana people are nomads and think nothing of a 25 miles walk in one day. Their main diet also consists of milk and cattle blood. In the rainy season, the women cultivate gourds and millet to supplement their diets. Camel milk is often used to feed babies as it is low in fat and easy to digest. 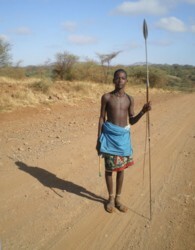 The El Molo are often touted as the smallest tribe in Kenya, both in number and stature. They hunt crocodiles and an occasional hippo for food, but fresh or dried fish is the staple diet. Not to be outdone by other tribes, although they are not quite as colorful, the El Molo enjoy collecting ornaments, such as strings of ostrich eggs and glass beads. Multiple metal wrist and elbow bracelets are worn by both men and women. The Somali are entirely dependent on the precarious grazing and water in the semi-desert where they live with large herds of camels, sheep, cattle and goats. Somali tribes are ethnically different from most other tribes in Kenya. An extremely well-spoken and politically cognizant tribe, the Somali are united equally by family allegiance and formal political treaties. In contrast with the rustic abodes, their carved headrests and woven artifacts are unmatched in careful detail and quality. The remaining 2% of Kenya’s population consists of Arabs (Swahili), Europeans and Asians. Along the coast the given name to the mix of people is Swahili. These Kenya people have been mixing, intermarrying and trading with settlers from abroad for hundreds of years. Basically descendants of Arab and Persian immigrants, they are distinguished in their shipbuilding and woodworking skills. The famous ocean-going dhows with their unique triangular sails still cruise up and down Kenya’s coast. The Asian community largely comes from the 32,000 indentured laborers brought in to build the cross-country railroad. When their contracts expired, many of these people settled down in Kenya. Life has not been easy for this group. The Asian populace today is largely Indian with a small mixture of East Asians, mostly Chinese. As each year passes, the unique melting pot of communities and cultures mix and blend, allowing Kenyans to live together in relative harmony. Distinct cultural lines become less distinguishable with the passing of time as people get on with their daily chores of their chosen lifestyles. While Kenya People are not without their population problems, their peaceful example stands out among the countries of the world. **There is an excellent book to see more images of Kenya People. The author and Photographer is Mirella Ricciardi and the book is called African Visions . There are some of her personal family snaps in there, many images of disappearing tribes and wildlife.